Looking back with the perspective of a year’s time…. It was nice to know that we were in the right place, but adjusting to new surroundings still took a lot of effort. There were practical issues. We had to figure out how to make the space work. The bedrooms are really small, only nine by eleven feet. I stood in the doorway and wasn’t sure we could even fit our bed in it and still have room to walk around. I had to measure and calculate on paper before I believed it. If we had a king-size bed instead of a queen, it wouldn’t have worked. It did feel awfully small for a while, but we got used to it. We had a basement, an unexpected advantage, with laundry machines and room to bring our freezer and food storage. The disadvantage was that access was from the outside. It was different to need a jacket and a key, or wait for a break in the rain, to go do laundry. After nightfall, you need a lantern, because no light penetrates that stairwell. I quickly realized that I’d better remember to bring the clothes out of the dryer and upstairs before I needed them the next morning; otherwise I was heading outside in my pajamas in view of the bus stop across the street. The kitchen’s upper cabinets rose all the way to the high ceiling, and all but one started just above my head. 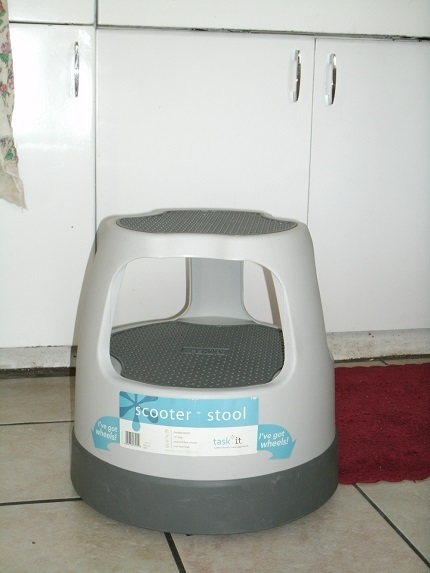 The first thing I did was buy a short round stepstool on casters, the kind that locks in place when you put weight on it. It was lightweight enough to pick up and carry to where I needed it, or nudge into place with my foot. The unanticipated help was that I could sit on it, rather than just bending over, when I needed to get something at floor level. That’s a real boon to a bad back. Meet my new best friend in my new kitchen. The tougher problem was the lower cabinets. The kitchen is old, and the long stretch of counter space is only sixteen inches deep — seventeen where it goes into the window well. I tried to close a cupboard door on my cookie sheets, and they were a fraction too big; so I broke the latch, my very first day. I put a begonia into a pot that had been part of a housewarming gift for the old house, and set it on my sunny but shallow new kitchen counter. It offered continuity and reminded me to be of good cheer. I find, however, now that they’re organized, that it’s easy to open the door and see everything there, no digging things out to get at whatever is pushed into the back. But it’s not like the old house was perfect. I would mutter darkly every time cooking was a major production, say for a holiday, that whoever had laid out my kitchen was not a cook. It had the refrigerator and stove at perpendicular walls to each other, with a big wedge section between, so I had to lean all the way forward onto the balls of my feet to clean into the corner. That was my working space, and it only fit one person. The other side of the stove was a narrow counter section of fourteen inches. The sink on the opposite wall had two side sections, neither one big enough to do a lot. 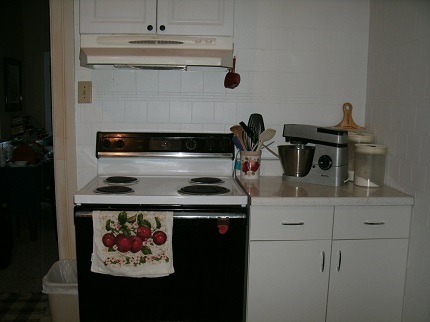 I said that wherever I moved, my requirement was that it couldn’t have a worse kitchen. I felt like this new one was about equal, not great but for different reasons. After some time to settle in, we bought a normal-depth small cabinet (30 inches across), free standing, for the corner by the stove and moved the refrigerator into the nook in back. It sat awhile with a large cutting board on top of one half, as we reached into our silverware drawer from the open top on the closer side. Eventually we found a counter piece for ten dollars at the Habitat for Humanity salvage store, and had a friend install it for us. Moving the fridge from this corner and setting up a new cabinet added some steps to my tasks, but gave me a workable space. Now I have one spot deep enough to roll out a pie crust or bread dough, with room for those things that didn’t fit in the other section. I can chop vegetables right there to toss into a pot — it was difficult with the refrigerator there to have no place to even set down a hot lid —, or pull my stand mixer forward and use it. On the other side I have a long expanse if I need to set up an assembly line, and small appliances like a blender and toaster don’t need much depth. I have a working kitchen. We assumed that there was a phone outlet in the living room somewhere, in addition to the one in the back room, which was obvious because it was at the level of the light switch. No such second phone jack existed. So we had to put in a splitter and thread a line through two other rooms in order to have a phone in the living room (after checking on the cost of an installation). There was also only one electrical outlet in that back room (or in the other bedroom either), and it had to support our whole computer system. The living room is much better supplied, but when the house was wired, I suppose that they figured you didn’t need much. Now this would drive lots of people crazy, but everyone knows we’re content to be a couple of dinosaurs anyway. Exhibit one is that we still operate on a land line for our phone service and our internet. My husband is the opposite of the ‘early adopter’ type; and we’ve never had the money or the obsession for the newest major toys. It would have been easy to moan our lot and feel anxious and frustrated. Our starting point was the absolute certainty that the Lord had opened this place up for us. He knew our needs, so we had faith that every challenge would have a solution. No working space? 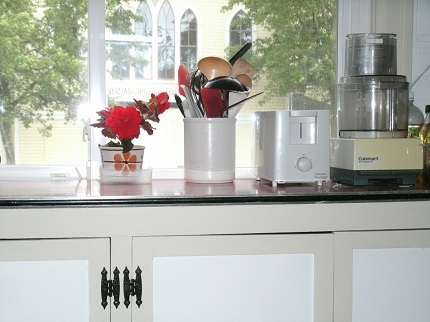 We rearranged the kitchen a little and bought that corner cabinet. Curtains for the long kitchen window? I envisioned ruffles catching fire in the toaster, so we ordered a custom polarized solar shade; and it ended up being one the best things we did, because we can see out but no one can see in. That long window looks out at the side street, with a southern exposure, so cutting the glare on a hot day or letting in the sunshine if it’s cold helps keep us comfortable. Some solutions came out of kindness, like a stand for my indispensable convection microwave that’s a full twenty inches deep; that won’t go onto a sixteen inch deep counter. I put out the word that I needed a sturdy stand for it, and a member of the ward brought over one that was gathering dust in her garage. It fit perfectly in the space where it needed to go. I do miss having a dishwasher, but I can manage. There have been times that I would not have been able to stand on my feet for long enough stretches to wash all my dishes by hand, but for just the two of us it’s not too bad. If I still had all my kids at home, it would be too much for me, but if it’s the trade-off for having the basement, I’m okay. And I wasn’t even thinking yet about a garden — no apartment would have given us that. Those basement stairs weren’t steep, except for the top one where the concrete slab that forms the walkway goes across the top of it. If all the steps had been that steep, it would have been a problem. But they aren’t, so it’s not. The tradeoff for small bedrooms is larger common areas, and a dining room. We don’t feel cramped in our surroundings. We had to get used to the street noise — but we’re not on the major arterial, which is the next street to the north, heavily traveled with no trees, or on the next street west, which is the neighborhood commercial strip. We would have hated either of those. Our southeast corner has a modest amount of foot and vehicle traffic, and a pleasant setting. The ways we solved our problems with the space might be completely different from how someone else would have. This little house would not have been the best answer for everyone, but it was a good answer for us. The Lord knew what would be manageable and what would not, and brought us to a lighter, airy space with storage, trees, relative privacy, and easy physical access. It’s an old house, and it has some quirks. However, none of its shortcomings are deal-breakers for us. Our Father in Heaven knew what we would need, and what we could and couldn’t do at this stage of our lives, and He matched us up with a home. It worked out much better than we could have done alone. Marian J. Stoddard was born in Washington, D.C., and grew up in its Maryland suburbs. Her father grew up in Carson City, Nevada, and her mother in Salt Lake City, so she was always partly a Westerner at heart, and she ended up raising her family in Washington State. Her family took road trips all over the United States and Canada, so there were lots of adventures. The adventures of music, literature, and art were also valued and pursued. Playing tourist always included the local museums as well as historical sites and places of natural beauty. Discussions at home, around the dinner table or working in the kitchen, could cover politics, philosophy, or poetry, with the perspective of the gospel underlying all. Words and ideas, and testimony and service, were the family currency. Marian graduated from Winston Churchill High School in Potomac, Maryland, and attended the University of Utah as the recipient of the Ralph Hardy Memorial Scholarship, where she was graduated with honors, receiving a B.A. in English. She also met the love of her life, a law student, three weeks after her arrival; she jokes that she had to marry him because her mother always wanted a tenor in the family. (She sings second soprano.) They were married two years later and have six children and six grandchildren (so far). She treasures her family, her friends, and her opportunities to serve. Visit Marian at her blog, greaterthansparrows. You can contact her at bloggermarian@gmail.com. Marian and her husband live in Tacoma, Washington. Together they teach those who are preparing to go to the temple for the first time, and she also teaches a Stake Relief Society Institute class.